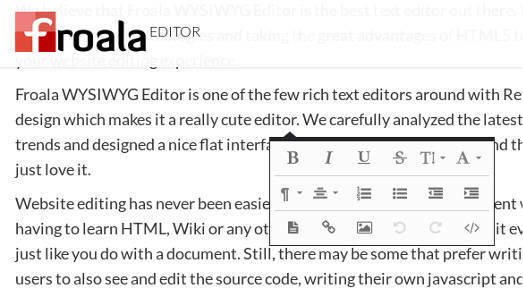 froala is WYSIWYG Editor made with jquery. It offers inplace editing on a webpage with a dropdown menu to modify the text. No toolbar or title bar for the editor. Froala is cross plaform and cross browser so it works perfect on every browser. The editor is available under a dual licensing model. You can benefit of the free HTML editor for personal and non-commercial project under the Creative Commons Attribution-NonCommercial-NoDerivatives 4.0 International License. For commercial web pages, three paid licenses are available, depending on the desired usage requirements.